A ceasefire to lose it all?! An analysis of the latest military developments in Ukraine. This morning, the Ukrainian president Poroshenko had his first public appearance in Australia. But is his optimism justified? Is there really a ceasefire in eastern Ukraine, which saw death and destruction by Russian aggressors over the last 7 months? Or is this just another silence before the storm, like the it happened in June and September for instance?! This morning, first report emerged of Russian forces, strengthening their positions near the strategic Bahmutki highway, which is partly controlled by Ukrainian forces and secures Ukrainian-held territory south of the Seversky Donets river in the Luhansk region (source). At least five tanks and several 2S1 self-propellered howitzers were seen taking up positions near Ukrainian checkpoints, without the Ukrainian army reacting to it, due to the “silence mode”, ordered by the government. Then this afternoon, chilling footage appeared, seemingly showing a large Russian invasion army convoy, going from the Donetsk area to the southern city of Mariupol, which Russian forces tried to take in August, but were stopped some 5-10 km east of it. The convoy was probably filmed near Starobesheve, as shown of the map. 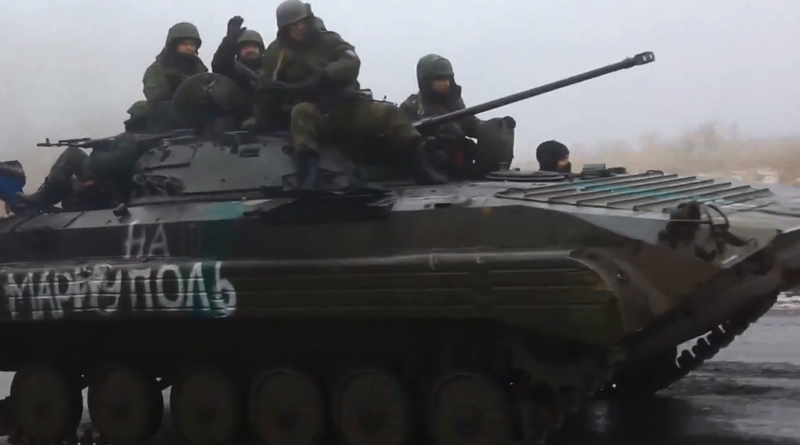 The footage shows dozens of modern battle tanks, namely T-72B1 and T-64BV, all brought to Ukraine by the Russian army via trains and low-loaders from all over Russia (as proven before by the Russian railway H2200 markings for heavy equipment on top of its wagons. The convoy also included a double-digit number of BMP-2, BTR-70, BTR-80 – all of those infantry fighting vehicles and armored personal carriers – as well as dozens of Ural and KamAZ trucks, transporting troops, ammunition and some of them towing field artillery pieces of different types. Last but not least it should be mentioned that many of the armored personal carriers caried the writing: “TO MARIUPOL” which seems to be hard to misinterpret. The following pictures show some of the weapon systems in the observed column. So what to make out of these obvious massive redeployments of Russian forces inside occupied Donbas? 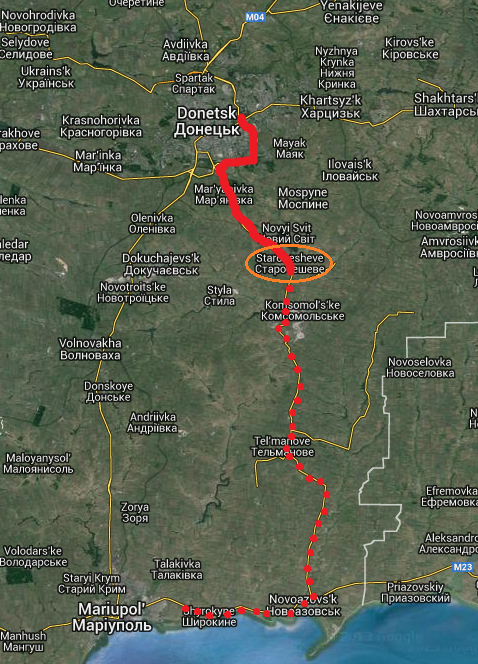 Regarding the large column, seen yesterday, there are three possible alternatives, why they left Donetsk towards the south. 1. It is possible that these vehicles and the involved troops are actually not going to Mariupol but back to Russia, using one of the Russian-controlled Ukrainian border posts in south eastern Donetsk oblast or the “green border”. The fact that these troops are so willingly showing their “real intention” – “to go to Mariupol” raises suspicion, if they are really so confident that they will give away all strategic advantage by not telling spectators, the internet – and by this the Ukrainian army, what they are planning right now. It is possible that the Russian regime – in its attempt to fix and calm the situation in eastern Ukraine – is withdrawing its “victorious” forces, however not willing to show that without any propaganda. 2. As I have argued over the last weeks, large Russian army movements and reinforcements to certain areas inside Ukraine do not automatically mean that those troops shall be used to fight Ukrainian soldiers, but to control and – if necessary fight and kill – “rogue” (pro-)Russian units, which have too high aspirations for the advance inside Ukraine (“Odessa” or alike) or are not willing to obey orders from the “rebel” military leadership in Moscow. There were several reports of Russian forces shelling each other east of Mariupol over the last 2 months, reports of Russian army forces retreating to Novoazovsk and only badly equipped volunteers or even locals holding the frontline, 5-10 km from Mariupol. 3. … and this is where we are coming back to the initial question: There is a – huge – possibility that the entire latest “ceasefire” in eastern Ukraine – which was never fully accepted or even implemented by ANY of the anti-Ukrainian factions, is solely used by Russian aggressors to prepare for the next – even more daily and brutal – round of fighting. These preparations could be made to take – as the leaders of the two “Peoples’ Republics always promised” to prepare for the battle that would aim to take all of Luhansk and Donetsk oblast and reach possibly even further. In this case, what we hear and see since the start of the latest ceasefire on Tuesday is a tactical redeployments and strengthening of troops, equipment and positions to simply break it another time and hit the Ukrainian army and people as severely as never before. 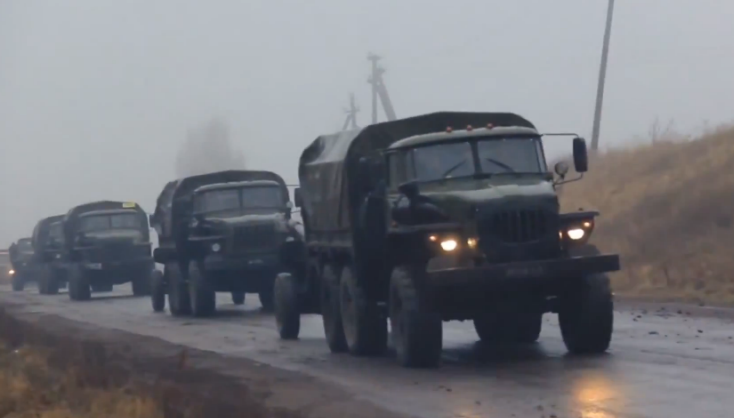 In this context, the arrival of another – 120 vehicle – “aid” convoy in the Donetsk and Luhansk regions this morning could be another sign of escalation, knowing these convoys transported military equipment to local forces before. Also in this context, the massive Russian military column that was seen yesterday and described above could indeed by the Battalion-size force which is to take Mariupol and the surrounding areas in the weeks and months to come. Although, there is a massive Ukrainian army force west of Donetsk, Russian invaders could have realized that they can rely on Poroshenko’s word and he won’t start any counterattack, no matter what. Knowing this, Russia could have decided to redeploy several hundred troops plus a mighty apc/tank/artillery force to the south to extend its controlled territory on the northern coast of the Sea of Azov. President Poroshenko’s policy – still – could be the smartest possible one, not provoking further aggression from the Russian side. However, there is a certain chance, his political and military restraint will be interpreted by weakness by the rulers in the Kremlin and their proxy forces in occupied Donbas, which could lead to Ukraine, paying the highest price for its current appeasement policy. Thanks for this! I caught some spelling errors. I really appreciate the work you do and would be happy to work with you as a copy editor. Get in touch with me on twitter @jakeschenberg or through email jakeschenberg (at) gmail (dot) com. Dear attentive reader, thank you very much for your reading and remarks. I produced the text w/o correction turned on. After you replied I pasted everything into Word, found your talked about mistakes and even more. Right now, I have the blod since 2 days and wrote 2 articles. So I think, it’s little too early to have a copy editor, which would be something, I’ld like to pay for too. However without making any money with the posts so far, I can not and don’t want to ask for some great service like this. Let’s stay in touch and I contact you as soon as this project and blog coins money. Thanks again and best regard. 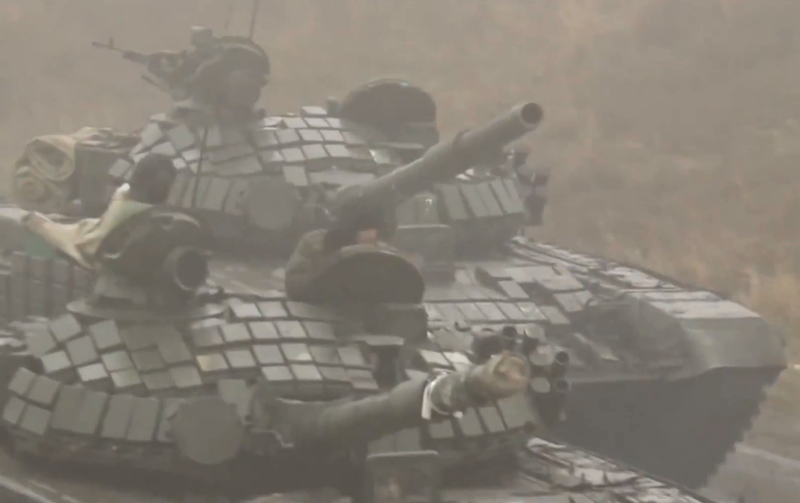 Photo of the T-64BV is actually T-72.Also to point out that those are not T-72B1 but T72BA tanks. Difference between the two is that the T72B1 has the optics of a T72A,no ATGM capability and has ERA armor on the hull front and the turret on the other hand the T72BA has 227 ERA bricks on the hull and turret and often on the side skirts(Same as in the picture above),has the optics and firing system of the more advanced T72B and an ATGM capability. so. Thanks again. I put in a new picture with a real T-64BV, which was part of the column. Will do more research about the T-72 variant and change it if I can confirm your remarks. What strikes me about that convoy footage is that it looks like something an on-location news crew would film, rather than the usual discreet & grainy smartphone footage taken by a real citizen that has appeared for other convoys. It’s produced in full view of the troops and therefore most likely filmed with their (Russia’s?) blessing and with pre-knowledge of where to set up the camera team. That, along with the “To Mariupol” message, leads one to believe this footage was intended to be picked up & discussed by folks like us. As such it becomes even more difficult to analyze, because aside from being some sort of re-deployment it’s also obviously part of the ongoing info war. Absolutely agreed and I also touched upon this issue in my post. Far too obvious to be “accidentally” filmed and published.